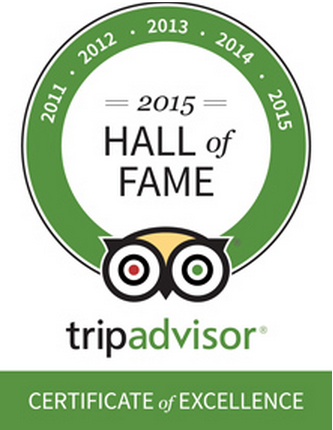 The Tarpon Tale Inn has just received its fifth consecutive Certificate of Excellence from Trip Advisor, and is proud to have been named to its Certificate of Excellence Hall of Fame! The Tarpon Tale Inn, Sanibel Island’s most charming inn, offers rooms ranging from cozy efficiencies to spacious cottage style suites, all within a short walk of our island’s famous shelling beaches, the lighthouse and the beautiful Gulf of Mexico. We’re located on the quiet east end of the island in Old Town Sanibel, just a few minutes drive from the causeway. You’ll be tempted by delicious home made ice cream and some of the area’s best breakfasts at island favorites just across the street. Each of our cottage style accommodations has its own distinct character, and they all feature a private patio. You can also relax in one of our hammocks, nestled in the shade of our palms. We want you to love Sanibel as much as we do, so we make it easy for you to enjoy all the wonders of our island. We offer complementary bikes, beach chairs, carts, umbrellas and towels, so the only beach gear you need to pack is your bathing suit! You’ll even find Sanibel shell and bird guides in your room! We hope you’ll choose the Tarpon Tale Inn as your home on Sanibel to explore all the wonders of our island… or simply to relax in paradise. We look forward to welcoming you! The only place I would stay at Sanibel! This is my second time to stay at the Tarpon Tale Inn and I wouldn’t want to stay anywhere else! The inn is within walking distance to the beach (about a block) and is close to the lighthouse. It is across the street from a great ice cream and bakery shop … I would never stay anywhere else but here!!!! We liked the slowness of the island, whole families riding their bikes, and a lower speed zone for cars. We liked everything about the inn. It was close enough to walk to the beach, a place to wash my shells, a cool, clean place to stay and friendly hosts. We loved the birdlife and the flowering trees and shrubs. We love Bailey’s grocery on the island as we had just become vegan and needed to cook most of our food. It was a good stay and we want to come back. Small property in best location of any on the island. Suites are modest but roomy and clean. Dawn, the owner, is pleasant and accommodating. Bicycles, beach chairs, umbrellas and beach towels are provides. Whether on bike or walking, minutes to an uncrowded beach. Quite locale. Minutes drive from the busier areas of shops and restaurants. My husband and I stayed here during the last half of our honeymoon, and we absolutely loved it. It was quiet and cozy, and very convenient for all of our needs. We had a fully equipped kitchen, which we used fairly frequently. We also had access to bicycles which was amazing for getting to the beach super quick, they also offer beach chairs, umbrellas, beach towels, shelling gear, and many more conveniences. The owners were very nice and helpful. We will definitely stay here again on our next trip to Sanibel! We stayed here recently for five nights. We loved the place. They provided beach towels, beach accessories, bikes, just about anything you would need for your stay on Sanibel. The bikes are a great way to get around the island. The place was quiet and clean. They don’t provided daily housekeeping, which I liked, and any additional items needed were just steps away. I recommend Tarpon Tale Inn and would definitely stay here again. I’ve stayed here twice, both in late winter. I’d readily stay here again the next time I go to Sanibel. The Tarpon Tale is a house or maybe two houses joined, and it’s been divided up nicely. Everything was clean and well maintained. The location was great, either for walking or riding a bike. This is one of those wonderful, sensible places. If you’re looking for a hotel experience, keep looking. This is a small, casual but very well done lodging choice.